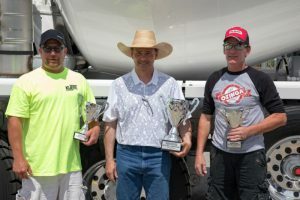 Bruce Mitchell, right, a ready mix driver with Ozinga, finished third at the annual Indiana Ready Mixed Concrete Association Mixer Driver Competition. Mitchell is shown with Charlie Davis, left, representing Materials Inc., who finished first, and Mark Goodwin, representing Kuert Concrete Inc., who finished second. Bruce Mitchell, a ready mix driver with Ozinga, which has several locations across Northwest Indiana, took third place at the 10th annual Indiana Ready Mixed Concrete Association Mixer Driver Competition on June 2. The IRMCA competition tests drivers on a written exam, truck inspection, and up to 10 driving challenges. Mitchell has participated in other competitions. In 2015, he took third place in the IRMCA competition and fifth place in the National Ready Mix Concrete Association Mixer Driver Championship. Mitchell has been with Ozinga since 2002 and has 25 years of experience as a ready mix driver.